Next National Congress on Hospital Engineering will be held during 17th-19th october 2018 in Zaragoza (Spain). InghoFM will be present again in this fantastic event; this time we will attend also as a speaker. 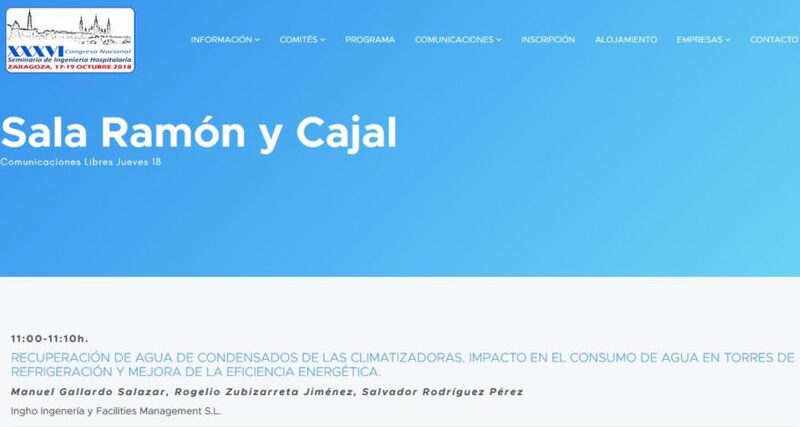 The oral communication has ben scheduled for thursday 18th october at 11:00 in the room Ramón y Cajal, we will speak about the impact of the water recovery from the condensate water in air handling units to feed cooling towers. We will show the results on the reduction of fresh water consumption and the energy efficiency improvement in the production units. We expect to meet you in the congress and share experiences to improve the efficiency in hospitals.